Animals rescued from abuse are often fearful and shy, but past experience has taught us that the right home can go a long way for victims of cruelty. In the case of a cat named Curry, a first-time adopter proved to be just what the doctor ordered, and now these two are both experiencing the singular joy of human-pet companionship. Here is Curry’s Happy Tail. Eric K. had been thinking about adopting a cat for a very long time. He had never had a pet before, much less visited an adoption center, but, he says, “I knew that there are a lot of animals who need homes.” In November, as the New York City air grew colder, Eric decided it was time. “I wanted a cuddle buddy and an animal to play with,” he recalls. Fortunately, Eric’s cousin, a former ASPCA volunteer, pointed him in our direction. At the ASPCA Adoption Center, Eric arrived with the hope of finding a senior grey cat. 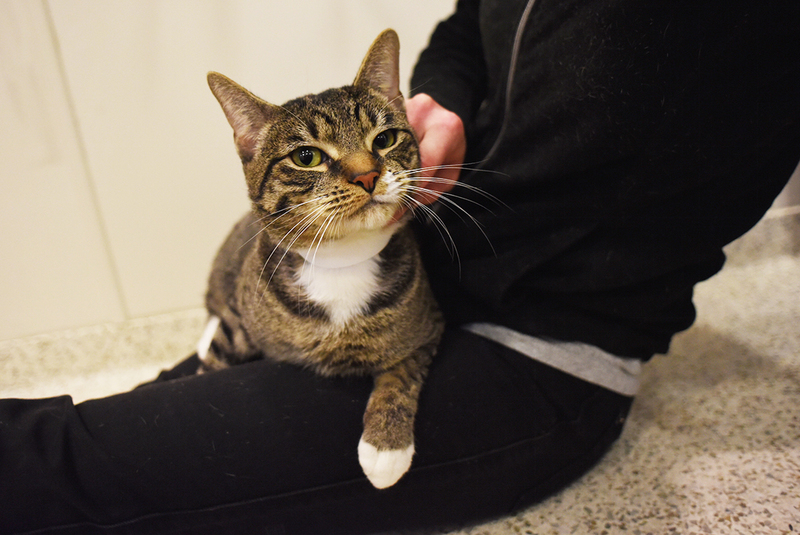 He and his roommates played with almost every adoptable feline at the center, but none of them felt like “the one.” On his way out, he stopped by another floor of the building, and that’s where he met Curry. Curry was nothing like what Eric had envisioned: The 10-lb. 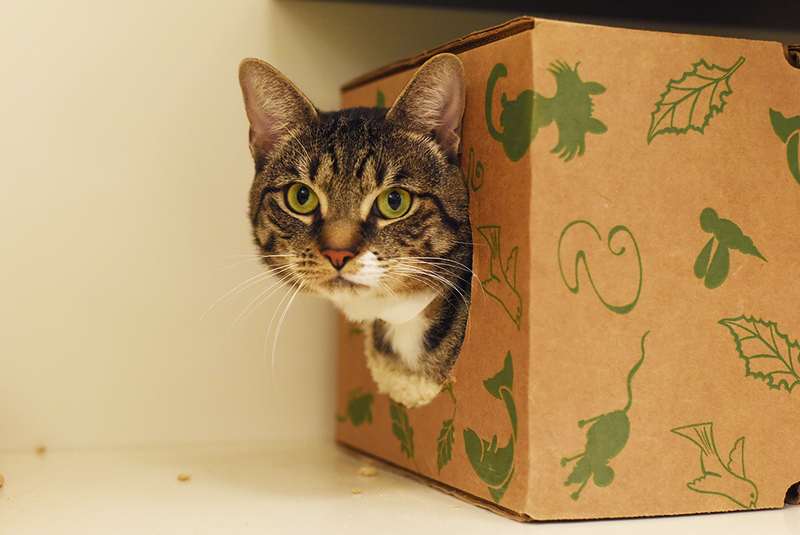 brown tabby was less than two years old and very, very shy. In August, he had been rescued from extreme cruelty by the NYPD, and spent the following months in and out of the ASPCA Animal Hospital receiving treatment for a painful urinary obstruction. What’s more, he was quite fearful around new people, so he’d been having a hard time getting adopted. But for Eric, there was just something about Curry. “Volunteers told me that he had had a pretty tough life. They told me that he had a urinary tract problem and that no one would adopt him because of that. He wouldn’t even come out of a cardboard box to play with us,” Eric remembers. But he had a feeling about Curry, and patiently tried to lure him out of his carrier with treats. “Without even showing his face, he reach his paw out of the cardboard box, grabbed the treat and took it into the box with him,” he laughs. “I knew I liked him at that point.” Eric then reached his hand into the carrier, assuming that Curry would try to swat or bite, but was surprised to find that the kitty rested his head on his hand. “That was when I knew for sure that he needed to come home with us,” Eric says. Back in his apartment, Eric gave Curry a new name: Graham. “Graham and I fell in love pretty quickly,” he tells us. “The first night he would hardly come out of his travel carrier, and the following week he would constantly hide underneath our couches, but after that he grew accustomed to us and now he can’t stand when we leave.” Eric was also unfazed by Graham’s medical issues, and was pleased to report that the sweet kitty underwent urinary tract surgery and is drastically improved! Despite a tough start to life, Graham proved to be an ideal pet. 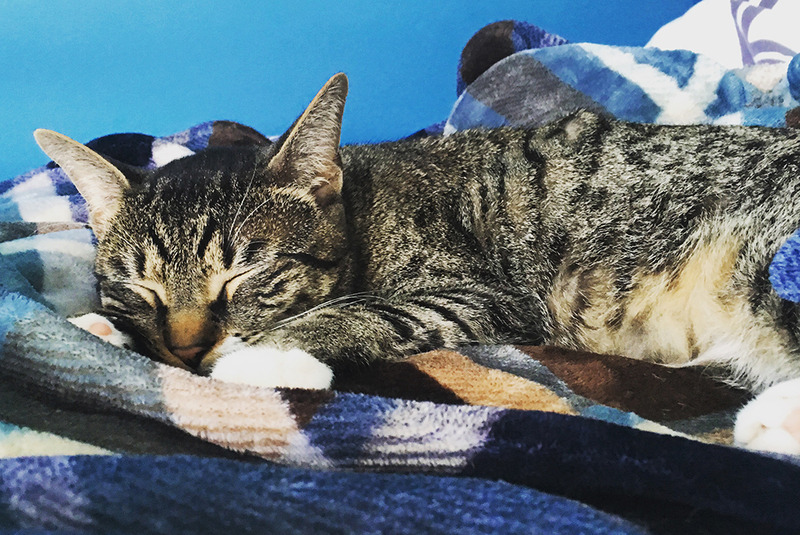 Eric tells us, “He loves lap time and napping with us during the day, and he loves to sit with us when we watch movies.” For both this formerly-abused cat and his new adopter, it seems that the first time was the charm. Congrats! Graham taking his customary after-breakfast nap in his new home.